Turbochargers, twin cams and other performance components are available to make a car powered by an economical four-cylinder engine go fast. Maybe elevating the engine to the non-economical class! But what if the car has to go faster than mechanical modifications can deliver? Really fast, like a race car. After engine development, aerodynamics become a factor. To boost performance further, design or modify the car to cut efficiently through the air mass it impacts as it accelerates. Indy race fans and Mopar fans should, and usually do, know of one memorable Dodge-branded car built with heavy emphasis on aerodynamics: the twin-turbo, mid-engine 2.2 Liter M4S Pace Car, a one-off effort sponsored by PPG Industries. Its build began in 1983 and it benefitted from development by Chrysler Corp. special-project engineers, a few independent Motor City shops and one lead Mopar automotive designer, Bob Ackerman, who retired from Chrysler in 1996 and presently lives in West Bloomfield, Michigan. The car set its own top speed record at 194.8 miles an hour with its engine outputting 440 horsepower at 25 psi maximum boost. Its coefficient of drag was an extraordinary 0.236. 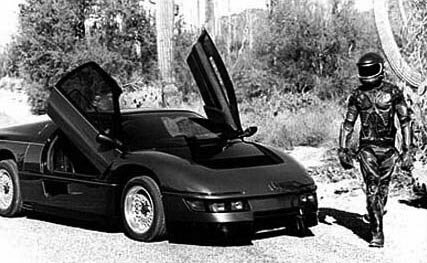 First appearing in public at the Detroit Auto Show in January 1986, the M4S was trucked to Arizona weeks later to be featured in a film in which it was to be the ride of an enforcer from outer space known as, The Wraith. The futuristic car went on that year to run as a pace car at Indy series events at tracks around the U.S. Years later, before a Le Mans-winning, 8-Liter V-10 Viper went on display at the Walter P. Chrysler Museum in Auburn Hills, the retired M4S had the distinction of being the fastest car in the Museum’s collection. allpar.com has posted other pages about the M4S, including a conversation with Joe Pappas, logistics coordinator for the duration of the car’s build and its Indy pace-car career; articles about, and pictures of, the original car at the Chrysler Museum; coverage of the car in the “The Wraith” film; and coverage of an M4S replica restored by car collector Lyle Suhr of Wichita, Kansas. In this article, Bob Ackerman recounts his story of the M4S. We also link to Bob’s own Web advertisement which offers dramatic M4S posters for sale. 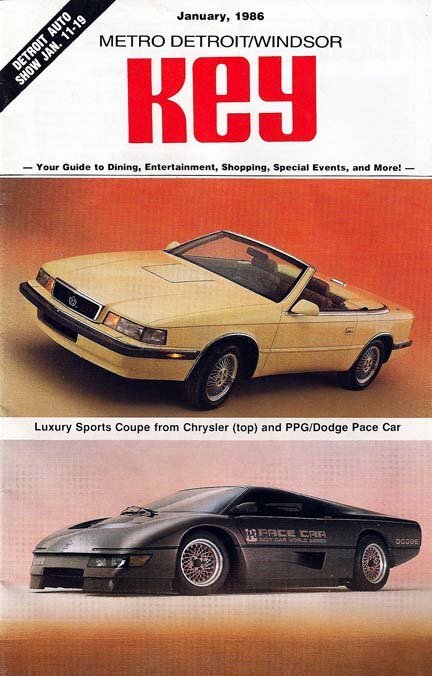 According to Bob’s personal log book, the pace car project got started at a meeting of Chrysler and PPG reps at the Chrysler design facility in Highland Park, Michigan, on June 13, 1983. This was in the complex of historic buildings that hailed back to the days when Walter P. still lead the company. PPG had been engaged with Big Three car companies in that period in developing many pace cars. 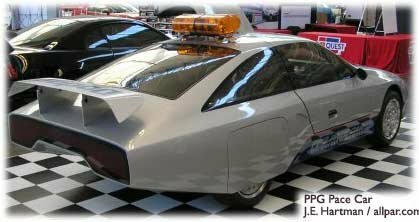 In the case of a new pace car from Chrysler, PPG wanted it to be capable of reaching 200 miles an hour. 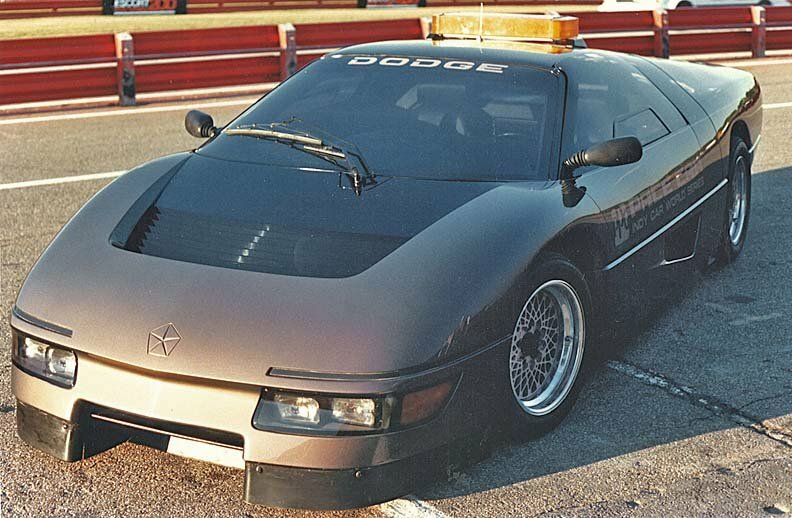 The previous pace car in the Mopar line was a 1984 Daytona Turbo Z that had run at 175 mph. 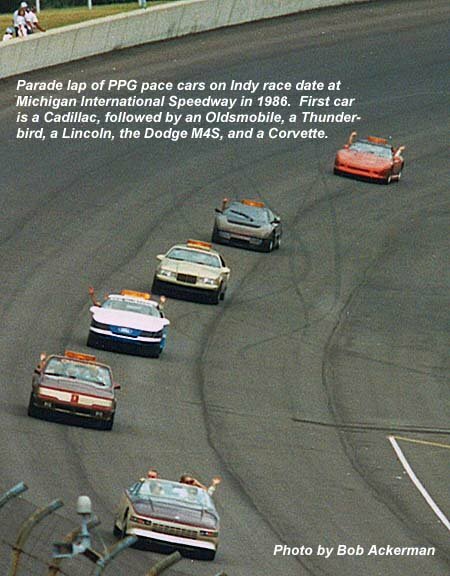 Several pace cars serve on the same date at Indy events, and the cars are driven in a pack for an opening parade lap. Bob explains the ritual: “Passenger and driver arms are extended to wave to the crowd in the grandstands. Passengers are VIPs or guests of sponsoring companies. When a car is actually pacing a race, the driver concentrates on driving while the passenger holds out his arm. He is wearing an orange glove. He signals for one more lap when the car behind him on the pole position is ready to go. Then the pace car leaves the track. The race cars lap once more and then get the green flag to start the race. As many as eight cars might be available for pacing duties at any one race. Cars take turns starting or restarting the race. Mechanical problems could force a car to retire on a date, allowing the next car to move up in the rotation. Three independent automotive support shops in the Detroit area also had major roles in the M4S project. They were Specialized Vehicles, Inc. (co-owned by founding Ramchargers member and retired Chrysler engineer, Tom Coddington), of Troy, Michigan; 3-D Industries, Inc., of MadisonHeights; and, Special Projects, Inc., of Plymouth. SVI built the engine and the roll cage; it also assembled the powertrain and body; and, it kept the car running for the months of its pace-car service. 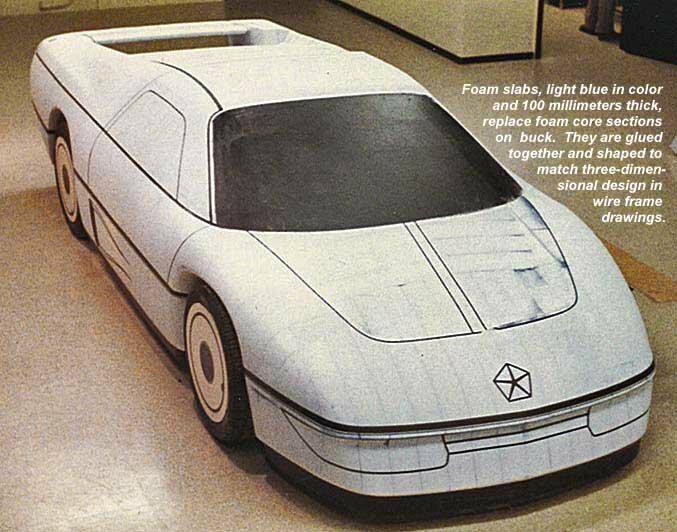 3-D Industries modeled the car in clay and produced body-part molds. Special Projects cast the body parts, did final paint and the interior. At the initial meeting with PPG executives, Bob suggested a pace car that looked more like a race car. “I was inspired by the cars running in IMSA (International Motor Sports Assoc.) series races,” Bob explains, “like the Porsche 962 GTP. Especially their aerodynamics, an important feature being the tailend that is abruptly cut off behind smooth body contours. “That tail-end design is called a ‘Kamm back’ after a German scientist, Dr. Kamm. A teardrop narrowing to eight degrees above horizontal is the ideal aerodynamic shape for a car, but a design actually extending to the point of the teardrop would be too long. Kamm figured out in the Thirties that you can cut off the extreme point of the teardrop. He found that the negative effect on aerodynamics by shortening the tail is insignificant; and that pressure actually builds up at the rear of the car that helps performance. So all of these cars that you see with a lip on the back and a spoiler, the NASCARs, the Le Mans Series cars, have embodied this concept for years and years. It’s the abrupt cutoff. Look at the back end of a Corvette, how brutally flat it is in back. That’s for a good reason! Elegant feature of the tail end is its integrated spoiler which is not visible from the sides. 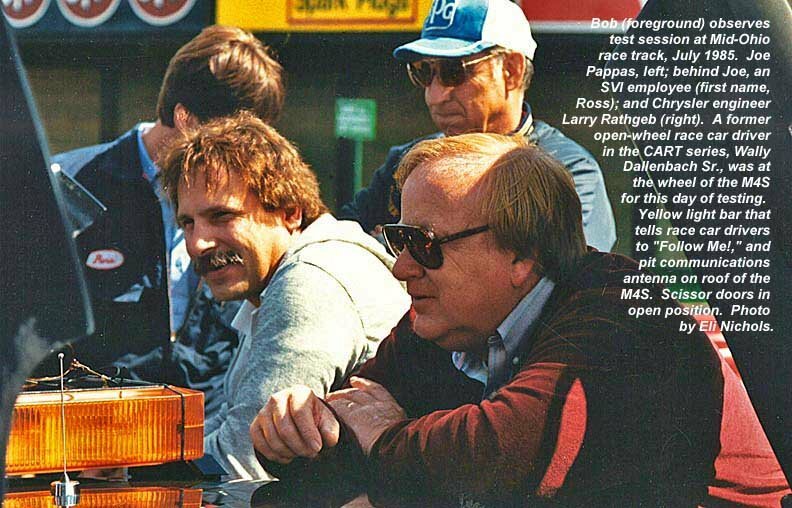 Bob explains, “Vice president of design at the time was Don DeLarossa and I got my orders from him. He said, I don’t want ‘any damn spoilers showing from the side view!’ So my marching orders were, I could design any car and make it look good but without a big spoiler. So in the side view you don’t see the wing on the tailend. There are pictures around showing a large Daytona-like wing on the back, but that was only for testing. It was removed before the Auto Show in 1986 and before the filming of The Wraith movie. “Wings on cars come from aviation wing design. You turn the thing upside down to get downforce instead of lift. I designed the rear wing on the M4S to be adjustable. It would have been raised in real time to increase downforce. But the wing was never actually made to adjust. Another feature that didn’t make it on the final car, the taillights – which were supposed to be sequential. They show up behind full-width plastic lens covered by a horizontal bezel. Build of full-size M4S model based on Bob Ackerman’s sketches begins at 3-D Industries studio. On wall in rear, numerous small “wire frame” drawings produced from Bob’s orthographic drawings by computer support personnel, and large side-view “tape drawing” (black photographic tape on Mylar) by Bob. In foreground, “space buck” construction by 3-D Industries modelers consisting of foam core board cut to match wire frame sections and mounted on wooden “armature” (plywood box on caster wheels). Chassis is not involved at this stage and wheels are only props. Windshield is foam core board. Drawings of the tube chassis and other parts were ready by the time the halved Huffaker unit was delivered. 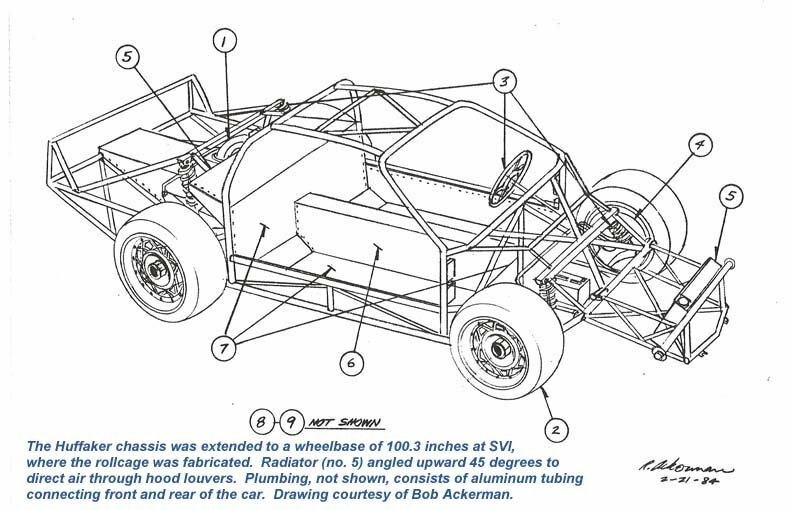 SVI technicians put it together for the 100.3-inch wheelbase and built the rollcage. 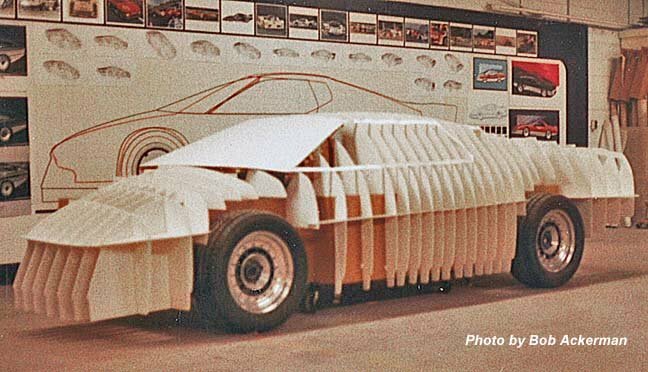 After sketches of the body exterior and full-size drawings were completed in Highland Park, the build of a full-size clay-over-foam model was outsourced to 3-D Industries, Inc. They started on a space buck (foundation for the model) around Nov. 30, 1983, according to Bob’s log book. Windshield, covered with black photographic tape to protect it from damage, is Ferrari Berlinetta Boxer glass. Wheel covers are foam on real tires. Two lines below windshield marked position of a strut between two recessed areas, but that feature was dropped in favor of single recessed area. Next step: thin clay layer to be applied over blue foam. Bob explains, “In the picture of me at 3-D Industries, I’m adjusting ‘dams,’ small metal flanges in the clay surface that set edges of the female molds. The molds have to be lifted straight off the model. There can’t be any negative surfaces gripping around the edges of the part. After the female molds came off the M4S model, around Feb. 20, 1984, they were sent to Special Projects to cast body parts. 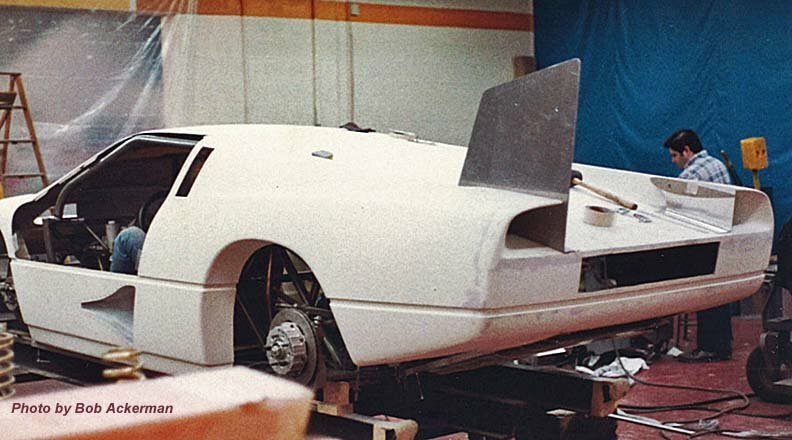 When finished, all body parts were roughly assembled at SVI for aero testing. A functional interior was modeled and fabricated at Special Projects. Assembling fiberglass M4S body parts at SVI. In the background, master metal craftsman, Ron Fournier. In talk ing to allpar about the M4S, Joe Pappas credited Fournier with fabricating the steel body panels of the 175-mile- an-hour Daytona Turbo Z PPG pace car mentioned above. Ron is apparently working on a vertical stabilizer of the Daytona-type wing tried during M4S testing. Ron was with Bob and the team of Chrysler aero engineers and SVI fabricators who took the M4S to Marietta, Georgia, for wind tunnel testing. The sill below the door opening has an “NACA scoop” that was dropped in favor of Bob’s custom styled inlet found to be aerodynamically better. 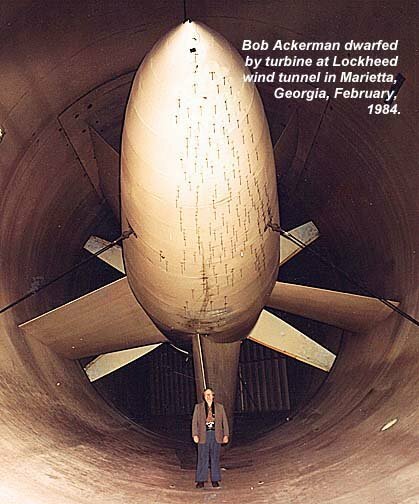 “In late February 1984, a team of Chrysler aero people and SVI techs took the car for aero testing to the Lockheed wind tunnel at Marietta, Georgia. I have old memos indicating we were there to start testing on Feb. 28th. We had only 17 hours of tunnel time scheduled. That isn’t a lot. One of the Lockheed operators told us that when Ford goes down there, they would take 17 hours just to balance scales. Tunnel time is very expensive. If I remember, it was something like eighty dollars a minute. We actually shared time with Kal Showket, who was there aero testing a Daytona race car. In the picture of me in front of the turbine, I’m wearing my work clothes. A lot of times you jump into the tunnel when they shut it down even before the wind stops blowing. You don’t waste any time getting in there to make changes and work clothes are the uniform of the day. “Wind tunnel models are made so that you can make quick changes. The crew of modelers and fabricators may want to rush in to change things as quickly as possible. On the M4S project, the engineers wanted me to do a ‘NACA scoop’ on the sides. This is a common form of low-drag air inlet design, originally developed by the U.S. National Advisory Committee for Aeronautics (NACA), the precursor to NASA. Car prepared for wind tunnel testing with long strands of black and white yarn held on with tape. Temporary wheels were eventually traded for BBS “spoke” wheels seen in other pictures. The M4S’s design enabled it to achieve a co-efficient of drag (Cd) of 0.236. “That was very good at the time for an actual running car with big wide tires,” Bob notes. “It’s extremely good. The Cd for a new Corvette is 0.34. Most sedans are around 0.35, or even 0.37. So when you get down below 0.3 you’re in pretty good territory. There have been some Ford and GM cars below 0.2. But they have little narrow tires. They are not your average street car or race car by a long shot. You can do things just to achieve low figures, but if it’s not in the real world, what does it mean? The ground effects material, the black rubber skirt on the front and sides, helped to reduce air coming under the car. The engineers were skeptical about the skirt but it brought down our Cd and really made the aero sing! The build completed, Bob Ackerman posed with his M4S at the Chrysler Styling Dome at Highland Park. He designed the car to race aerodynamic standards. Its co-efficient of drag (Cd) of 0.236 compares to a Cd greater than 0.3 for most production cars, including the Corvette at 0.34. The car’s coordinated lines show in the scissor door opening from the trimline encircling the body, and the rear cutline of the door lining up with the uniquely-styled side scoop. The scoop is functional, feeding air to the intercooler, the rear brakes and the transmissionoil cooler. “Side view mirrors are actually motorcycle sport mirrors that I bought at a local motorcycle accessories shop. They are manually adjusted. The opening on the side windows is made just big enough that the driver can reach an arm through it to adjust the mirrors. Doors open from the horizontal design line. The portion of the side below the line, housing the scoop, is really a sill. July 1985 at Mid-Ohio test track. In Bob Ackerman’s design, juncture between M4S hood and windshield is a straight line. “Most cars have a broken surface where windshield meets [the] hood,” Bob points out. The black rubber valence below the winged air intake “virtually closes off air flow under the car like on the NASCAR cars today.” Side mirrors were purchased by Bob at a motorcycle shop. Photo by Eli Nichols. “When I was presenting the M4S to Lee Iacocca in the Styling Dome in Highland Park, I told him about an experience I had in Miami when the car was there to pace the Indy Car race. There was a gentleman who said he had five Ferraris. He asked when the M4S would go on sale because he wanted one! He said, ‘I would get rid of my Ferraris in a minute if I could have one.’ I thought that was a good Italian car story to tell Iacocca. It fell on deaf ears. “When Mr. Iacocca was reviewing the car I was hoping he wouldn’t try to get in because, even more so than with a 300 SL Mercedes, you have to step over this wide, high sill to get down into the car. It’s not the most graceful thing to do for a guy wearing a business suit. He didn’t attempt it, and I was happy about that. “But one other note about the color! A friend of mine from General Motors said, ‘Hey, Ackerman! You really made a mistake with your color. If you had made it red it would have been on every auto magazine cover in the United States. He was probably right because if you count the number of red cars you see on the magazine covers it’s pretty extensive. Bob Ackerman and four of his design concepts on the theme Return of the Luxury Coupeexhibited at the Ypsilanti (Michigan) Orphan Car Show, on September 25, 2011. Held by that city’s Automotive Heritage Museum, the annual show is dedicated to innovative American cars produced by companies that no longer exist, such as Hudson, Tucker, and Kaiser-Frazer. The exhibit was organized by The League of Retired Automotive Designers. Photo by Ron Van Gelderen. “Early on, I was in an engineering meeting with Chrysler engineers Larry Rathgeb, Joe Pappas, Tom Coddington and Mike Koran (co-owner with Tom of SVI). My role in the project was to design the exterior. The engineers specified a transverse mounted 2.2 liter engine. I suggested that, if the engine goes in longitudinal, ‘north-south’, we could get an English Hewland gearbox or a German ZF gearbox. Those units offered both an infinite amount of gear ratios that you could get with the transmission and a quick-change feature. It’s an absolute must on a race car that you have a quick-change capability. Your gear ratios are often wrong from one race course to another and you have to change gears. So I believe we just ran out of gearing on this car. 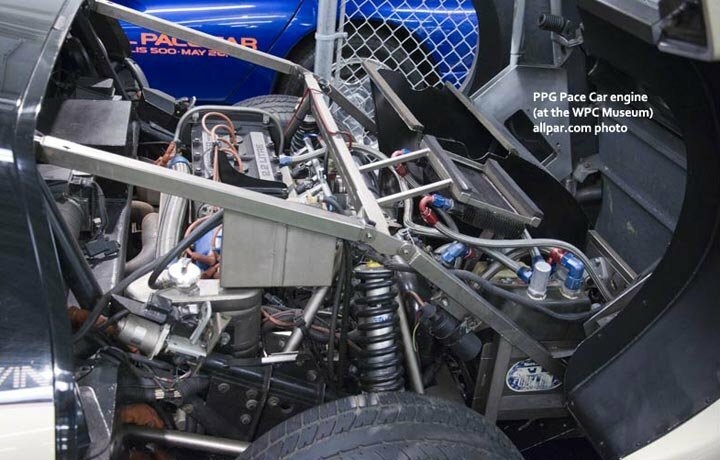 As Joe Pappas implied in his allpar interview, the car’s weakest point was its transmission. They spent a lot of money to come up with one that would hold up, and still it was prone to breaking down. I guess the engineers were of a mind, Chrysler is selling K cars with transverse engines. Let’s not change that. “I don’t want to be too critical because it’s been twenty-plus years down the line. It’s all history. I was quite disappointed that the car didn’t go over 200. It would have been a big deal then for a 2.2 liter engine. ‘Over 200 miles an hour,’ compared to ‘194.8 miles an hour.’ Two hundred just sounds better. Quite frankly I was hoping for 205, 210, 212, because I think the car was capable of it with the right gearing. “Suspension on the M4S could be raised in order to drive it on and off transporters. When it was shown it was often left in transport mode. One year at ‘Eyes on Design,’ a local concours here in Detroit, I was very embarrassed seeing the car sitting high like a kit car. Even at the Chrysler Museum, I was after them for three years to lower it. I offered to get someone over from SVI to do it. I understand a new curator has seen to the adjustment. “On one early speed run the car hit a deer that darted across the track. Graham McRae, 1973 Indy Rookie of the Year, was at the wheel driving at almost 180 miles an hour. He came back to the paddock area a little shaken up. On impact the fiberglass caved in and snapped out, cracking paint and exposing the white gel coat underneath. It looked like someone had thrown a bucket of white paint at the car. “The car was finished in ’85. Then the movie situation arose. I was asked by Tom Gale, who was then a director at the design office, what I thought about the car being in a movie. I said I wasn’t excited about it. I said, this is a legitimate car and Hollywood has a way of making cars into jokes. I mentioned the Lincoln Futura that became Batman and Robin’s car. I said I wouldn’t want the M4S to become another Batmobile. “Over my objection, the car was sent to Arizona in February 1986 for the filming. However, the M4S doesn’t actually appear in the final cut. The car in the movie is always one or another of the dune buggy replicas. A few of us went for our first viewing of the movie. A marketing executive seeing it begin became so upset and he got up and left the theater. That the M4S is still of interest to car enthusiasts today is clear by its presence on the World Wide Web mostly in connection with the movie. Also, the replica restored by Lyle Suhr drew much attention at the 2010 Carlisle All-Chrysler Nationals where it was presented in the T Building, the traditional venue for invitation-only classic and collector vehicles. Bob was present for that event, standing by to talk to visitors about the original M4S. “Lyle came for a visit to Detroit from Wichita,” Bob recalls. “I arranged entry for him into the Chrysler Museum to see the ‘real’ M4S. I told the curator Lyle wanted to look in, out and under it. In the basement where the car is displayed, after a few minutes, Lyle looks up and says, ‘This isn’t like my car at all! It’s made like an airplane!’ All the welds and all the finesse that went into putting the M4S together but don’t show well in pictures become striking when you see the car close up for the first time. Did Bob Ackerman Ever Drive The M4S? Bob acknowledges having owned 45 Mopars. The fastest were a V-10 Viper and, second, a 1970 Challenger 440 Six-Pack. For looks his all-time favorites are the 1971 Plymouth Satellite Sebring and the 1996 Chrysler Sebring convertible. But, he “also liked the looks of the ’94 through ’97 LHS Chrysler, which I had a lot to do with.” His current ride is a 2011 Chrysler 300. Automotive designer Robert Ackerman was born and grew up in Connecticut. He studied design at the Art Center School in Los Angeles. When he was a student there a major percentage of car designers at companies around the world came out of that institution. Bob’s career included design work at North American Aviation and General Motors. At GM he worked in the Chevrolet and Oldsmobile design studios. 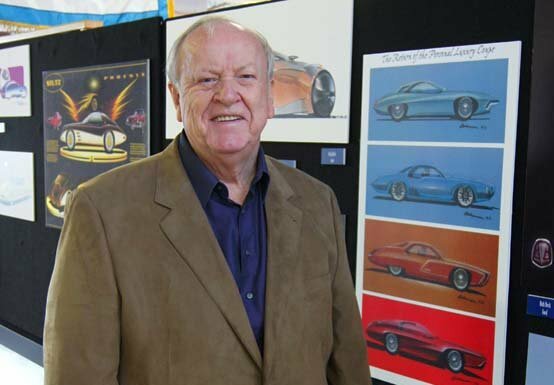 Not happy with the level of acceptance of some of his designs at General Motors, he landed a job at Chrysler in the Dodge design studio in 1969. In his first assignment, he worked on the ’72-74 Challenger. He retired from Chrysler in 1996, never regretting the move from General Motors.